Buttersby is a rather self-absorbed alpaca. She is a fictional huacaya (the furry Ewok-type of camelid) who enjoys a second career as the mascot of Diamond Triple C Ranch. 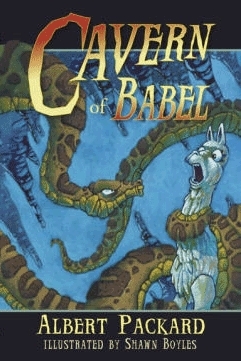 Her first career as the heroine of Cavern of Babel took her on a huge adventure to Peru where she almost perished at the hand (or grip) of a snake. Yikes! But fortunately she survived to enjoy life and retirement at Echo Valley Fiber. We think she's pretty terrific! And sometimes you might see her review a product or two in the store. Meander, on the other hand, is very laid-back. He is a fictional suri alpaca. Suris have fiber that is long, silky and twists in pencils It's almost unbelievable that these two types of alpacas are not cousins or siblings, but they're totally both alpacas. Meander becomes the rescuer in the story but, typically, he takes it all in stride. He has his own Facebook page, though admittedly it hasn't been updated in a while. If you'd like a T-shirt with these delightful guys back-and-center, watch for it in the store. He's hankering to be able to review our new suri roving. It's up for grabs, so we'll see what happens. The misadventures of Buttersby and Meander are featured in this book published by Diamond Triple C Ranch. Written by Bryce Moore under the pseudonym, Albert Packard, it is written for middle grade readers. Find out more about Bryce and his other fantasy books. His latest book, The Memory Thief, was published September 2016.